Henry Hayward has been living life the way he's wanted—working hard, playing hard—but when his girlfriend tells him she's leaving, it destroys him. In a quest to recover, he joins an army-affiliated contracting crew that takes him overseas to a Canadian base in Afghanistan. In the company of friends, he begins to mend: having laughs and being rebellious, blithely unaware of all he's left behind. But everything changes during a roadside incursion when a routine patrol turns fatal. And Henry, who survives, knows in his heart that he is responsible. Upon returning home, tormented by guilt, he resolves to take care of the people and places around him: Martha Groves, whose boyfriend was killed in Afghanistan; his friends and neighbours; and a summer home that needs revitalizing. Henry tries his best to seek roots after a rootless life, collecting around himself a "community of a hundred people" for whom he cares deeply and is responsible. But he hasn’t factored in family history and social infidelity—and Martha has a revelation of her own that may change everything. Minister Without Portfolio illuminates the power and violence of self-creation. It asks: To whom are we beholden? Who do we adopt—and who couldn't we live without? It is an emotionally affecting work, filled with truths about the frailties and miracles of human nature, by a writer of exceptional talent. After living what he believed was a normal and content life, Henry's world was turned upside down when his long term relationship ended. To help get over the pain and loneliness, Henry continued to bury himself in his work. This lead him to Afghanistan where he experienced a life changing event - the loss of a co-worker and friend. As he begins to come to terms with the loss of Tender Morris, Henry begins to evaluate his life and realizes that he has nothing. Not a person, a house or land to call his own. Now, being fully aware of his situation, Henry decides to make a home for himself in Renews. A coastal community in Atlantic Canada. He leans on his friends for support and everyday necessities like water and electricity as he begins his journey. He plans to build a home out of Tender Morris' run down house. He pours all that he has into the house so it can act as an anchor and foundation for his new life. With the house being taken care of, Henry realises that he is also missing a human connection. A night of passion becomes a budding bond between himself and Tender's widowed girlfriend, Martha. The two become close as they mourn Tender's loss. Together they face obstacles with land ownership, the building of a new home and the expected hardships that one would expect with their relationship. Minister Without Portfolio surprised me. As I flipped through the first part of the book, I was unsure of whether or not I would be able to finish it, let alone learn anything from it. I'm glad I continued on. Henry's story, though gut wrenching at times, was one that I was happy to read. He is a symbol of hope and hard work. Despite all of the negativity that surrounded him from his break up with Nora to all that followed it, he continued to push through. It is an inspiring story which left me to question how close this fictional story was to reality. Reading about the hardships that the various men and women were experiencing. From finding work in Western Canada to the women's loneliness as their loved ones left for long periods of time just doesn't seem too far of a stretch. 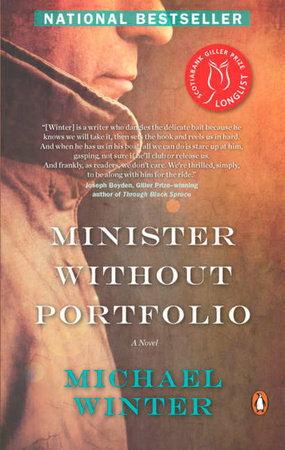 From the setting in Atlantic Canada to the completely different writing style, Minister Without Portfolio was an enjoyable book. I do think some readers may have to overcome a few hurdles as the writing does take a bit of getting used to. If you like punctuation marks and the lack of them bothers you, this one will definitely make you cringe. But, I do believe the story it tells is a very engaging and inspiring one. This is the final book I read from the Canada Reads short list. Minister Without Portfolio is being defended by Adam Copeland. Copeland is likely better known to most as former WWE wrestler, Edge. I think Minister Without Portfolio has a chance to do fairly well in the competition. However, for it to do well, I think, lies in the hands of Mr. Copeland. He will have to ensure his points during the debates are concise and focus on Henry's gut wrenching journey as he begins his new life.